Shoe : Hand made, semi leather upper, leather sole, comfort lining, special laces. Frame : Engineered plastic, 15degree speed action, clip axle. Wheels : 64mm, 88A, plastic wheel. Size : Small 10 to Big 8 (12 Sizes). Shoe : Hand made, genuine leather upper, compressed leather sole., comfort lining, special laces & eyelets. 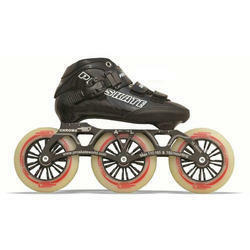 Wheels : 65mm, 80A, medium speed rink / road wheel. Size : Small 8 to Big 11 (17 Sizes). Shoe : Hand made, genuine leather upper, leather sole, comfort lining, special laces. Wheels : 62mm, 94A, Super high speed rink wheel. Bearing : ABEC 3,5,9, ceramic balls (white/black), delrin cage, racing series. Shoe : Hand made, genuine leather upper, with Buckle compressed leather sole., comfort lining, special laces & eyelets. Wheels : 62mm, 94A, High Speed rink wheel. Bearing : ABEC 3,5,9, Ceramic Balls (White/Black) derlrin cage, racking. Shoe : Normal Leather Shoe. Wheels : 58mm, PU wheel. Bearing : ABEC 3,5,9, Cermic Balls (White/Black) Delrin Cage, Racing Sreies. 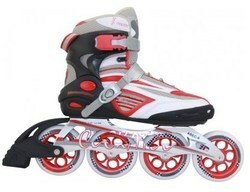 Adjustable Inline Skates having abec-7 bearings, with PU CASTED wheels of size 100mm having alloys in wheels. Boot : Pro Back Carbon Composite base, Microfiber lining, Buckle Ankle Power Strap , Heat Moldable. Frame : Double void 7000 series AL, Single Axle, Light Weight, 195mm Mounting, Power Arch Design. 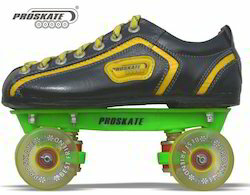 Wheels : 85a 110mm, choice of Performance Urethane in (ultra high , super and high speed ) for all- around Surfaces. Bearing : ABEC- 5 Speed Bearing. Boot : Pro Back Carbon Composite base, Mocrofiber lining, Buckle Ankle Power Strap, HEat Moldable. Frame : Double Void 7000 Series AL, Single Axle, Light Weight, 165/195mm mounting, Power Arch Design, 11.25inch Length. 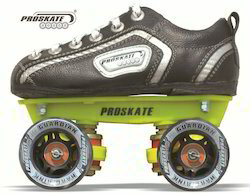 Wheels : 85A Hardness, 110x3, Performance urethane for rink and road. Bearing : ABEC 5,7,9, Ceramic balls (White / Black), Delrin cage, Racing. Size : UK Junior 11 to 6 (EU 30-39) - All Sizes Available. Boot : Pro Back Carbon Composite base, Mocrofiber lining, Buckle Strap. Frame : Double Void 7000 Series AL, Light Weight, 195mm mounting, Power Arch Design. 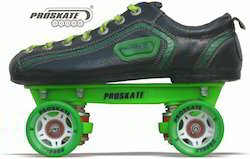 Wheels : 85A Hardness, 110x4, Performance urethane for rink / road. Bearing : ABEC 5,7,9, Ceramic balls (White / Black), Racing. Size : UK Junior 4 to 11 (EU 38-45) - All Sizes Available.